Send your thoughts, information and solutions, or your organization name and goals. 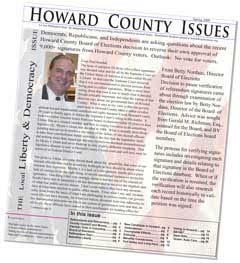 Howard County Issues publishes opinions and provides a method of communicating observations, organizing community, communicating solutions and recommendations, frustrations, and organization contact information. Read opinions, respond, or initiate. Posts may be added to this site, and/or published in the quarterly Howard County Issues, distributed as noted on right . Our advertising rates are excellent at $40 for a business card size ad for quarterly distribution of 5-10,000 copies along with internet access to your ad indefinitely.